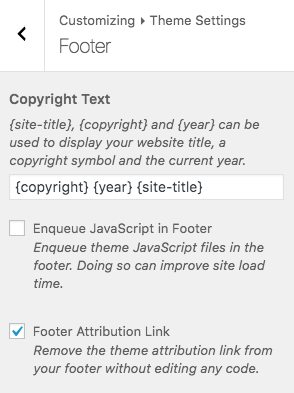 Footer related settings are at AppearanceCustomizeTheme SettingsFooter. In addition to the dynamic content tags listed above, this field also accepts regular text and HTML. The footer attribution link appears after the footer copyright text (Theme by Puro). This link can be removed from the footer without editing any code by upgrading to Ultra Premium. The footer attribution checkbox can be found at AppearanceTheme SettingsFooter, once upgraded to the premium theme version. If you’re using Ultra Free and would like to review the premium offer, navigate to Appearance > Ultra Premium from within WordPress.